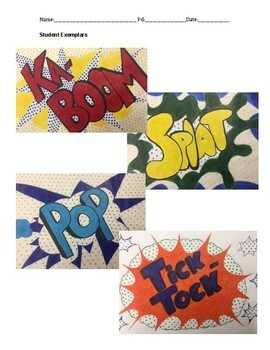 Students create word art in the style of Roy Lichtenstein, following a chosen color scheme and inputing Ben-Day dots. 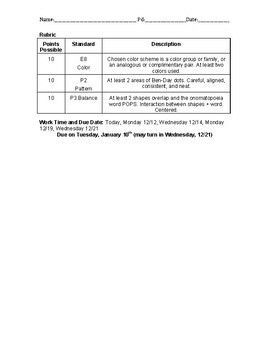 This handout includes a project description, instructions to plan and sketch, student exemplars, and a thorough rubric that grades use of color, balance, and pattern. 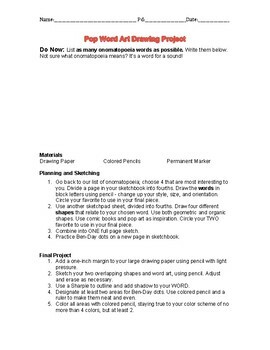 This project took 10th graders about five 75-minute class periods to complete and only requires drawing paper, colored pencils, and permanent marker.